BENJAMIN DISRAELI AUTOGRAPH Envelope Signed. British Conservative statesman and twice Prime Minister (1868 and 1874-80). 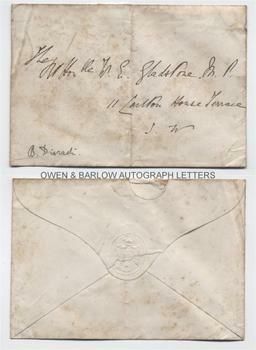 Autograph envelope, signed (B. Disraeli) and addressed in his hand to The Rt. Hon. W.E. Gladstone, M.P., 11 Carlton House Terrace, S.W. With his embossed seal of the office of Chancellor of the Exchequer on verso. No date but 1858 or 1859. Approx 5.75 x 4 inches. Central crease, foxing spots, dust staining and remains of an old mounting hinge on verso. In generally good condition. Disraeli served three terms as Chancellor of the Exchequer (1852, 1858-9 and 1866-8). For much of this period, Gladstone was his opposite number on the Liberal front bench and Gladstone succeeded Disraeli as Chancellor in 1852 and 1859. Communications between the two great political rivals of the 19th century are autographically rare and for much of their time they were openly hostile to each other. In 1858, however, there was a correspondence between the two in which Disraeli, as Chancellor, tried, unsuccessfully, to bring Gladstone into the Conservative government of Lord Derby. He urged in his letter that Gladstone should place the good of the Party over personal animosity. Gladstone had moved to 11 Carlton House Terrace in 1857 and so this letter must date from the time of Disraeli's conciliatory offer. A rare and interesting association item.